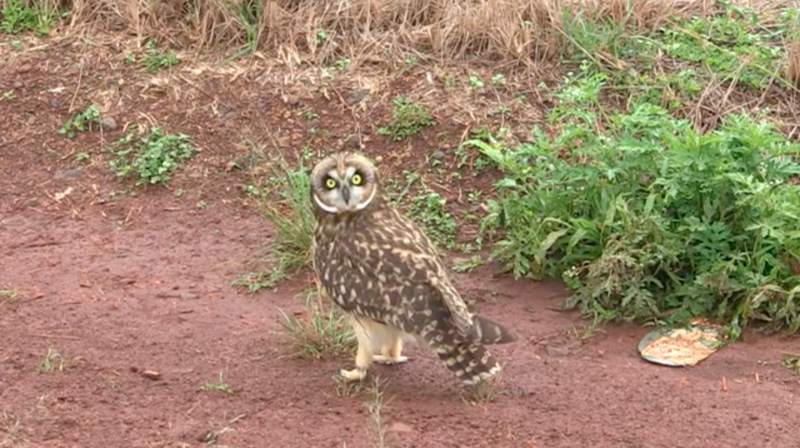 (Lihue, Kaua‘i) – After more than a month of rehabilitation a pueo (Hawaiian Short-Eared Owl) was released late yesterday on private ranch land in west Kaua‘i. The release site is near to where the young bird was rescued in late March and taken to the Save our Shearwaters (SOS) facility at the Kaua‘i Humane Society. Dr. Andre Raine of the Kaua‘i Endangered Seabird Recovery Project (KESRP), spotted the bird struggling alongside the highway on March 22nd. Raine normally works with threatened and endangered seabirds, which given him a keen eye for all bird species. His wife and daughter watched, as his son was given the honor of opening a cardboard carrier to let the rehabilitated pueo return to the wild. Tracy Anderson of SOS said, “After Dr. Raine brought the bird to us, we treated her head and eye injuries and a fractured radius in her left wing. On April 11th she was flown to the Hawai‘i Wildlife Center on the Big Island so that she could continue her rehabilitation in their large flight aviary. 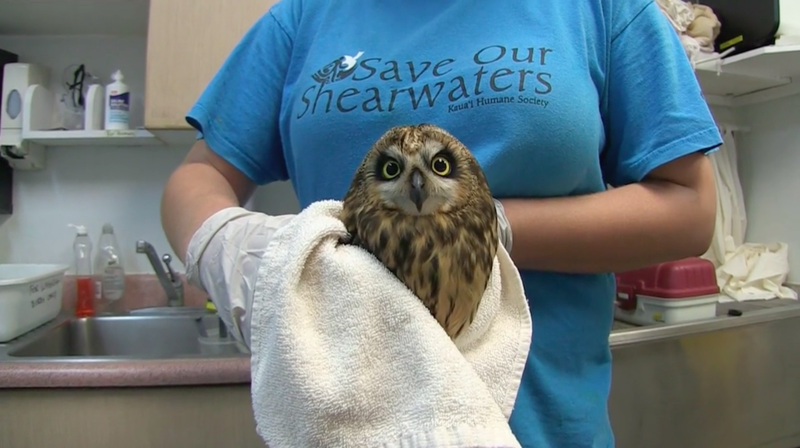 She healed up nicely and was flying so the wildlife center sent her back to us yesterday for release.” Anderson theorizes the young pueo was hit by a car. Owls are often attracted to roadsides by rats and mice, which in turn are attracted by the easy pickings of food scraps and rubbish discarded by people. Anderson and others who work with endemic birds like the pueo remind people that the act of throwing trash on the ground not only impacts the environment visually but can have a direct and detrimental effect on wildlife like pueo. Pueo are found on all of the main Hawaiian Islands and on Oah‘u they are listed by the State as endangered. Specific population numbers are hard to come by. 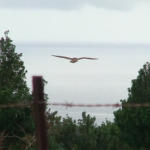 On Oah‘u, the DLNR Division of Forestry and Wildlife (DOFAW) is currently developing study parameters for conducting an island-wide sur vey of the owl. 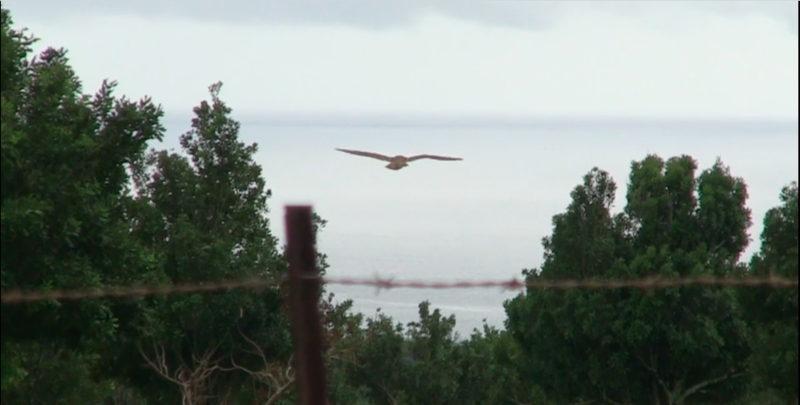 The pueo is one of the more famous of the various physical forms assumed by ʻaumākua (ancestor spirits) in Hawaiian culture. On a country road, near Kalāheo, eight-year-old Callum Raine, under the watchful eye of Anderson slowly opens the box carrying the pueo and tips it up. The bird looks around for a few seconds and then hops out onto the road. It then spends a few minutes fluffing its wings and surveying its territory before flying off into the sunset. Prior to its release a metal band with a unique identifying number was put on one of its legs so it can be identified if it’s ever picked up again. 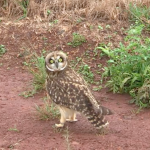 The owl’s fate is much more positive than that of a pueo rescued by an Oah‘u family on a North Shore road earlier this year. A fracture in that bird’s wing was not going to heal properly AND it would not be able to fly again, so it had to be put to sleep.